Ruth Lorenzo Pascual was born on November 10, 1982 in Murcia, a south-eastern region of Spain. The day ыhe was born, she cried so hard so that doctors predicted she would become a singer. At a very young age she became a fan of the musical Annie and tried to sing along with it. When she was six years old she discovered music by opera singer Montserrat Caballé, and she began to sing opera, imitating Caballé's vocals. At the age of 11, Lorenzo's family moved to Utah, USA and this was the first time she had the opportunity to be involved in music at school. Lorenzo was entered into several competitions and played lead roles in musical productions such as The Phantom of the Opera and My Fair Lady. When she turned 16 the family returned to Spain and she had to cancel singing lessons for some years. "Being 11, I started working in a warehouse of a restaurant in Utah and when I ordered cans of ketchup, I imagined I was in a stadium full of people, the audience was waving, singing loudly with me..."
When Ruth was 19 she joined a rock band, though before that she was singing only opera music. In 2002, she unsuccessfully auditioned for the 2nd series of Operación Triunfo, which that time acted also as Eurovision preselection. After that she made a big decision to quit her job in her family's business in order to pursue her dreams once again, but after three years of touring around Spain the group has split up and Ruth landed a solo contract at Polaris World where as well as performing, she worked as a PR consultant. In 2008, Lorenzo auditioned for the fifth series of The X Factor in United Kingdom. She impressed the judges and made it through to the show chosen from 270,000 candidates. Her show mentor was Dannii Minogue and she has been eliminated in on the 8th week of the competition (5th place). Videos of her spectacular performances, such as Always of Bon Jovi, Knocking on heaven's door of Bob Dylan or Purple rain of Prince accumulated over 100 million views on YouTube (the latter song became an Internet phenomenon with millions of views worldwide, reaching one million in less than 24 hours). After X Factor, Lorenzo performed at gigs across the UK and Ireland and joined the X Factor Live tour with fellow finalists offering more than 200 concerts throughout Europe. In between 2009 and 2011 she has been performing at various locations in UK, Ireland and Spain, she has also written a song for her mentor Dannii Minogue's comeback album. Signing originally with Virgin Records/EMI, she has not released any material with them, and continued working as independent artist. Her debut single was financed by crowdsourcing. The debut single "Burn" was released on June 27, 2011 in Spain and on the August 7 in the United Kingdom. After more time, in June 2013 she had released "The Night", which originally apeared as free download single. On November 11 came "Love is Dead", again released independently. At the end of 2013 Ruth had finally signed with a new record company, Roster Music and her debut album "Planeta Azul" is set to be released on March 1. She was confirmed as one of 5 participants of Spanish national Eurovision final on January 20, being prior to that for several month in talks with broadcaster for the internal selection. Her Eurovision entry was officially released on February 18 and became number one on iTunes. "I am aware that I am not well-known in Spain, but the support of Eurofans in recent months has left me blown away, I cried with excitement when I saw all these messages of love. Actually I'm doing all this and for them and sometimes feel a little dizzy because it is a great responsibility not to disappoint"
Dancing in the Rain is written by Ruth Lorenzo herself with Jim Irvin (who has worked with international artists like Lana del Rey and David Guetta) and Julian Emery (main producer of the British band McFly). Produced between Madrid and London, Ruth wrote this song during one of her "darkest moments" in the capital of the UK. The song, being international pop (with parts in Castilian and English), is reminiscent of Titanium by David Guetta "for it's message of light and hope" and Unconditionally of Katy Perry for "pop style and catchy chorus." 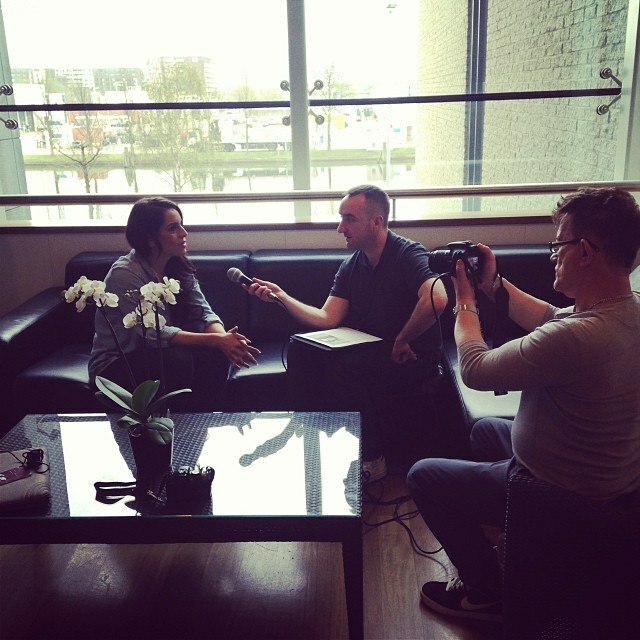 At this moment it is not decided whether song will be fully English or billingual at international Eurovision. "Dancing in the Rain" came to me while I was in a pizza restaurant in London and going through a really tough time with a record label, is about moving forward, about getting up after knockbacks, and believing in yourself. I learned to accept adversity and just take it as a challenge to continue to fight for what I believe. That is the message of the song. Even if it rains, we have to learn to dance in the rain and never lose faith"
At the national final Ruth has performed with three backing vocalists Karla Martínez, Inés Asangono and Yasmira Arias and pianist Pedro Contreras, dressed in outfit designed by Gema Nicolaj. Currently, there is no decision yet, how the song will be staged in Copenhagen, though the proposal of having rain on the stage is investigated from technical point of view. RTVE will broadcast 1st semifinal and final of Eurovision with commentary of José María Iñigo, who will be doing it for 4th consecutive year. Carolina Casado, hostess of the show Corazón, will be Spanish spokesperson. "I have decided to sing Nessun dorma because people in UK know many of my aspects and wanted me to do something new and surprise, and people loved it. I love opera and this song in particular, because it speaks of hope and sunrise, it's very beautiful", says Ruth. "I've started singing opera self-taught, I really haven't been taking any singing lessons until two month ago". For Eurovision weeks she promise more of special repertoire for Eurovision fan audience. Complete coverage of London Eurovision party is available on our promo-tours page. Spanish broadcaster TVE invites all Eurovision fans to help to prepare Dancing In The Raid fun video. You can record with a camera or mobile a 10 seconds singing of any of 10 parts of Dancing in the Rain, or create a short video with a poster containing a word or a phrase of the song. Videos are accepted by April 30 via online-form and later TVE will compile from them one fan video present to Ruth. For the complete coverage of the Eurovision In Concert in Amsterdam check our Promotours page. 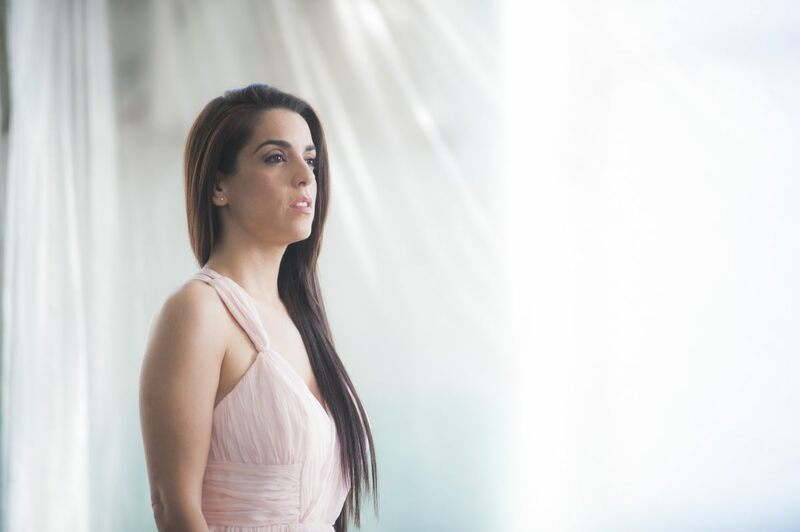 In her interview to ESCKAZ.com Ruth Lorenzo, representative of Spain in the Eurovision Song Contest 2014, said that Eurovision came to her as a surprise. "It wasn't on the plans at all, I was coming to Spain to sign with Spanish label and start working on the album. But then fans thought I'm coming home for Eurovision and they have started active campaign online, and then only couple of days before the line-up for the national final was finalized, I said fine: I'll do it"
"I want to play with the darkness", singer told to ESCKAZ.com in Amsterdam, where she traveled this weekend to participate in the Eurovision in Concert, after that she will be appearing at Eurovision In Concert in London and she also plans to visit Poland and Austria in her promotional tour. Speaking to RNE program La Noche en Vela just before the departure from Spain, Ruth said that her performance in Copenhagen will have no water nor dance. "I struggled to get water, but it has been so difficult. I did not think there was so much logistics involved, in Eurovision everything is timed per second", said Murcia singer, who also explains that the winner of last year Emmelie Forest will neither have rain in "Rainmaker" performance. "They've done a spectacular setting , but it's all LED screens," she adds. In her own words, "I'm going to Eurovision to sing, and in most of times you do not need more than a microphone to do that". The Spanish representative has also made clear that the Italian dancer Giuseppe Di Bella will not accompany her on the stage of B & W Hallerne. Ruth Lorenzo says that "everything is going well" and confesses that she has "conflicting feelings". "It's all very intense, but the intensity is a thing I really like", she says, emphasizing that "I have never known how to do things by halves, I give it all". She says that everyone, who has been doing Eurovision in past years were giving her the same advice: "Just enjoy it". "Winning is the goal, but apart from that I'm still going to love it, performing on a huge stage, in front of million viewers", she adds. In her performance, "everything is thought of". "My team is thinking about everything, even that 10 seconds missing from the song are done for a reason," she says. About her wardrobe, she has mentioned that it will be a dress specially made ​​for the occasion and she wants to "be a little diamond on stage". Singer has also revealed that besides full English version, her team is also working on a club remix. Speaking about other competing entries, she has noted that her favourite is UK. "As a character I love Conchita, she is brilliant. I love Sweden as well, it's also great this year". On Thursday Ruth Lorenzo has visited the Zoo Aquarium of Madrid to complete her brave mission. However, before moving closer to sharks she had tried to relax visiting panda Xing Bao and feeding flamingos. Yet the time has come. "Before entering the aquarium I became very nervous, I cried, I was really scared, sharks all the time were approaching, looking at me... I really had a hard time"
Singer had to take psychological practice for several minutes, before joining shark expert Karlos Simón, Pablo Montoto (curator of the aquarium) and Teresa Migoya, who was recording Ruth in the water, as well as grey reef shark, nurse shark and bull shark, a nice animal of 159 kg weigth and 3 meters length. "When I got down at the bottom I felt fine, but after a while I have started to get tachycardias and I had to leave. I've got a lot of panic seeing the gray sharks because they moved very fast, and the bull shark because it moves very slow... seems quiet but that's precisely it's tactic to attack, it made me very scared. I feel a little bit bad because I wanted to spend more time underwater, but really I could not. As I came out the first thing I did was calling my mother, who was very worried because he knows my shark-o-phobia." So, despite managing to dive with shark Ruth was unable to overcome her fear. Moreover, she says she doesn't want to hear anything about the sharks in the nearest future! "I have no plans to repeat this experience! Next time, I propose a challenge of swimming with dolphins, or rather eating chocholate!" After swimming with sharks, Ruth returns to the stage to promote "Dancing in the rain" around Europe on a tour that will take in the coming days her to London, Manchester, Birmingham, Amsterdam and Madrid. On 22 February, during the broadcast of the show Mira quién va a Eurovisión, Ruth Lorenzo has promised to the viewers if she won the ticket to Eurovision, she would face her greatest fear: diving with sharks. So the moment of truth has now arrived! 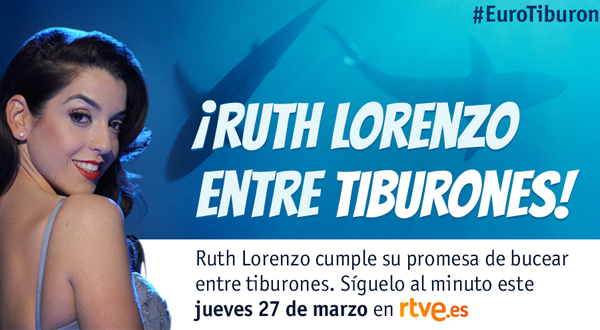 On Thursday, March 27, Ruth will spend a pleasant afternoon diving with sharks of the Zoo Aquarium of Madrid. Ruth loves the water and is a fan of The Little Mermaid, but feels a panic of sharks. For her it is a challenge to face this fear, but as she is thankful to all the people who voted and chose her as the representative of Spain for Eurovision 2014, she wants to fulfill her promise and show that she is a woman of word. Ruth will dive with several species of sharks and will be accompanied during the dive by Karlos Simón, one of the greatest shark experts of Spain and Pablo Montoto, curator of the Zoo Aquarium of Madrid. 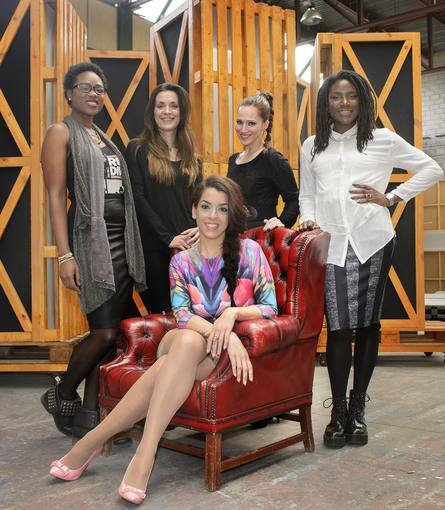 Backing team for Ruth Lorenzo has been announced. Ruth choices are Mey Green, Sandra Borrego, Aiwinnie Mybaby and Alana Sinkëy. For Mey Green this will be the 3rd consecutive year at Eurovision, as she backed Pastora Soler and El sueño de Morfeo. In her solo career, in 2013 Mey released "Wanna Dance" which became a dance radio hit. Mey also starred in musicals We will rock you and El diario de Anna Frank, is winner of several competitions, finalist of X Factor. Sandra Borrego already performed at Eurovision with Lucía Pérez in 2011. Sandra began studying dance four years. After graduating from Classical Ballet, Modern and Tap Dance school she worked as a dancer in various television programs and galas, he has participated in musicals such as Hello, Dolly or Mamma Mia and has made ​​concert tours with singers like Ana Torroja or Malú. Two more names are Gospel choir singers with Guinea origin Aiwinnie Mybaby and Alana Sinkëy. Aiwinnie Mybaby has been largely inspired by the music of her father, a singer who lives in Madrid. Gospel Factory choir Member, Aiwinnie musical influences come from her first passion, jazz, through Bossa Nova, soul, R & B and reggae. Participant in two editions of the Festival Sisters Sing The Reggae Queens, she has been part of group Watch out performing black music in Madrid. Singer-songwriter Alana Sinkëy is vocalist of Madrid band CosmoSoul and Madrid Gospel Choir Gospel Factory. She has also participated in projects of fusion as PATAX and collaborated with artists like El Chojin, Blue Dog, Freedonia, or Raphael. 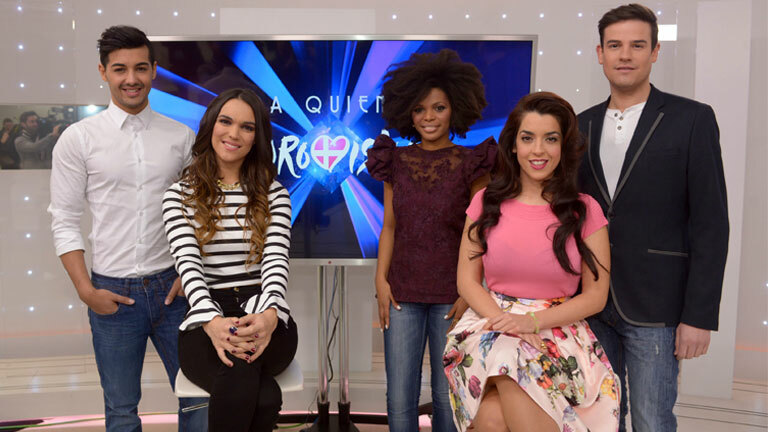 On Monday at 22.30 RTVE will air special edition of 'Mira quién baila' (Come Dancing) show with participation of Ruth Lorenzo, who will present her Eurovision entry. More Eurovision songs will be featured in the show, including vote for the favourite Eurovision song from the repertoire of MQBaila orchestra. Choreograper Poty will also teach on how one prepares chreography for the Eurovision Song Contest on the favourite Eurovsion entry, selected by viewers. Today was premierred music video for "Dancing in the rain" that was directed by Paloma Zapata. Music video also includes final version of the song "Dancing in the rain", with even more extended use of English language. "It was difficult to record the video, we needed a lot of precision, we have got cold, I have fallen, I had hoarse throat... But I do not like easy things, I always complicate a bit. The result was worth it, it is very artistic", said Ruth Lorenzo. In the video starred also Italian dancer Giuseppe Di Bella, choreography was created by Miryam Benedicted. The video was recorded on March 8 in the old factory of Fabra i Coats that dates from XIX centrury. Water is the main element of the music vdieo and appears there in many ways, not only in the form of rain. It is still being discussed on how this concept can be implemented on Copenhagen stage. On Tuesday, Ruth Lorenzo has filmed at the Royal Observatory of Madrid Eurovision postcard for Spain. "We wanted to do something very artistic, willing to show a cheerful and carefree side of Spain", said singer. Also these days Ruth Lorenzo has been working on the music video for "Dancing in the rain". "These have been very intense days, because we have been recording the video and it's been tough because there has been a lot of water and I was speechless! At the same time, FAME'S - Macedonian Radio Symphonic Orchestra has recorded 80 string pieces for the new version of the song", explained singer. Real Academia de Española (The Royal Spanish Academy) has sent an unusual statement to Leopolodo Gonzalez-Echenique , president of RTVE. Its director, José Manuel Blecua, wants to interfere in the performance of this year's Eurovision Song Contest, appearing concerned that "Dancing in the Rain" is performed partly in English. Blecua ensures that the RAE has wanted to be discreet from an issue like this, but wants to put its emphasis on the fact that there are 500 million people who speak Spanish. In fact, according to RAE, many Latin American countries have gone directly to them to express their opinion. Due to this academics have decided to send the statement to RTVE. The song was originally written in English, but the artist decided to make a version with Spanish language for the preselection. Now, she has passed the ball to the audience and wants them to be the ones to decide the final language of the song. On January 20, Spanish broadcaster RTVE has announced names of 5 candidates that are running to represent Spain in Eurovision Song Contest 2014: Ruth Lorenzo (British X Factor), La Dama, Jorge Gonzalez (preselection 2009, Operación Triunfo, The Voice), Raúl Fuentes (2nd in Spanish NF 2000), Brequette Shane (The Voice). Read more about candidates here. National final will take place in February with broadcast on La1 and TVE International, winner will be chosen by combination of televoting and professional jury vote. On February 10th the date of the national final Mira quién va a Eurovisión was confirmed to be February 22 at 22.00 CET. Gala will take place in TVE Studios in Sant Cugat (Barcelona) and will be hosted by Anne Igartiburu. Among jury members will be Merche, David Bustamante and Mónica Naranjo. Voting will be open from the beginning of the show, during all performances and 10 minutes after their end. Gisela will be special guest of the show. Рут Лоренцо Паскуаль родилась 10 ноября 1982 года в Мурсии, в южно-восточной части Испании. В день рождения, она так кричала, что доктора предсказали ей в будущем стать певицей. В раннем возрасте, она стала поклонницей мюзикла Annie и пыталась подпевать ему. В возрасте 6 лет она открыла для себя музыку оперной певицы Монсеррат Кабаллье, и начала петь оперу, имитирую голос Кабаллье. Когда ей было 11 лет, семья Лоренцо перебралась в Юту, США, и там получила первую возможность заниматься музыкой в школе. Лоренцо принимает участие в нескольких песенных конкурсах и играет заглавные роли в школьных постановках таких мюзиклов, как The Phantom of the Opera и My Fair Lady. Когда ей исполнилось 16 лет, семья вернулась в Испанию, и Рут пришлось отменить все занятия музыкой на несколько лет. "В 11 лет, я работала на складе в ресторане в Юте, и когда я перебирала банки с кетчупом, я представляла себе, что стою на стадионе, полном людей, которые все хлопают и поют со мной..."
Когда Рут исполнилось 19 лет, она стала петь в рок-группе, хотя до этого пела только оперную музыку. В 2002 году она безуспешно пытается попасть на 2й сезон шоу Operación Triunfo, служившего в том году отбором на конкурс Евровидение. После этого, она принимает важное для себя решение, отказаться от работы в семейном бизнесе, для того, чтобы вновь попробовать реализовать свою мечту. Но спустя три года выступлений по Испании, ее группа все-таки распалась, а Рут подписала сольный контракт с компанией Polaris World, где не только была певицей, но и пиар консультантом. В 2008 году Лоренцо проходит прослушивание на 5й сезон шоу X Factor в Великобритании. Она впечатлила судей, и была выбрана в основную часть шоу из 270 тысяч кандидатов. Ее ментором на шоу была Данни Миноуг, и она завершила свои выступления на нем на 8й неделе, заняв 5е место. Видео ее выступлений с такими песнями, как Always - Bon Jovi, Knocking on heaven's door - Bob Dylan или Purple rain - Prince собрали более 100 миллионов просмотров на Youtube (последнее видео вообще стало интернет феноменом, собрав миллион просмотров менее чем за 24 часа). После X Factor, Лоренцо выступает с концертами по Великобритании и Ирландии и присоединяется к туру X Factor Live с другими участникам проекта, дав более 200 выступлений в Европе. Между 2009 и 2011 годами Рут выступает в Великобритании, Ирландии и Испании, она также пише песню для нового альбома своего ментора Данни Миноуг. Заключив предварительное соглашение с лейблом Virgin Records/EMI, она так и не смогла выпустить с ним каких-либо релизов и продолжила работу в качестве независимого артиста. Ее дебютный сингл был спонсирован краудсорсингом. "Burn" вышел 27 июня 2011 года в Испании и 7 августа в Великобритании. После этого, в июне 2013 она выпустила сингл "The Night", который первоначально предлагался для бесплатного скачивания. 11 ноября вышел "Love is Dead", вновь выпущенный независимо. В конце 2013 года певица все-таки подписывает договор с новым лейблом, Roster Music и ее дебютный альбом "Planeta Azul" запланирован на 1 марта. 20 января ее имя было объявлено в составе 5 участников национального испанского отбора на Евровидение, хотя было известно, что в течении нескольких месяцев до этого велись переговоры о ее выборе без открытого конкурса. Конкурсная песня была официально выпущена 18 февраля и сразу же возглавила чарт iTunes. "Мне понятно, что я не слишком хорошо известна в Испании, но поддержка еврофанов за последние месяцы меня очень воодушевила, я плакала от радости, когда получала от них множество приятных сообщений. Я делаю это ради них, и иногда даже побаиваюсь, потому что несу на себе большую ответственность не разочаровать"
Dancing in the Rain написана самой Рут Лоренцо вместе с Джимом Ирвином (который работал с такими международными артистами как Лана дель Рей и Дэвид Гетта) и Джулианом Эмери (продюсером британской группы McFly). Рут написла эту песню в один из самых сложных своих моментов в столице Британии. Песня представляет собой международную поп-музыку (исполняющуюся на кастильском диалекте испанского языка и английском). Она напоминает собой Titanium Дэвида Гетты за счет "своего месседжа света и надежды" и Unconditionally Кети Перри своим "поп стилем и запоминающимся припевом". Пока точно неизвестно, прозвучит ли на Евровидении полностью английская или двуязычная версия песни. "Dancing in the Rain" пришла ко мне, когда я была в пиццерии в Лондоне, и проходила через сложные времена в отношениях с рекорд-лейблом, она рассказывает о том, как двигаться вперед, даже если что-то сбило тебя с ног, и верить в себя. Я научилась принимать превратности судьбы, и продолжать бороться за то, во что я верю. Таков и месседж моей песни. Даже если идет дождь, мы должны научиться танцевать под дождем и никогда не терять веру"
На национальном отборе Рут выступила с тремя бэк-вокалистами Karla Martínez, Inés Asangono и Yasmira Arias и пианистом Pedro Contreras, в платье, созданном дизайнером Gema Nicolaj. Пока неизвестно, какой будет постановка номера в Копенгагене, но рассматривается техническая возможность создания на сцене дождя. Телеканал RTVE покажет 1й полуфинал и финал конкурса Евровидение 2014 с комментариями José María Iñigo, который будет комментатором шоу для Испании в четвертый раз подряд. Carolina Casado, ведущая программы Corazón, объявит результаты испанского голосования. "Я решила спеть Nessun dorma потому что жители Великобритании знают меня уже со многих сторон и хотели бы, чтобы я показала что-то новое, неожиданное, и им это очень понравилось. Я люблю оперную музыку и эту песню в частности, потому что она говорит о надежде, о восходе, она очень красивая", говорит Рут. "Я начала петь оперу как самоучка, кроме как в последние два месяца я вообще не брала уроков вокала". К неделе Евровидения она готовит еще сюпризы в своем репертуаре, который исполнит перед фанатами конкурса. Полное освещение London Eurovision вы можете найти на нашей странице промотуров. Испанский телеканал TVE пригласил всех поклонников конкурса помочь в подготовке фан-видео на песню Dancing In the Rain. Вы можете записать на камеру или мобильный телефон 10 секунд исполнения любой из 10 частей песни, или создать короткое видео с постером, содержащим слово или фразу песни. Видеозаписи принимаются до 30 апреля через специальную онлайн-форму и, затем, TVE создаст из них фан-видео в подарок Рут. Полное освещение Eurovision In Concert в Амстердаме вы можете найти на нашей странице промотуров. В своем интервью ESCKAZ.com Рут Лоренцо, представительница Испании на Евровидении 2014, рассказала, что участие в конкурсе стало для нее неожиданным. "Это совершенно не было в моих планах. Я приехала обратно в Испанию, чтобы заключить договор с испанским лейблом и начать работать над альбомом. Но фанаты подумали, что я вернулась для участия в Евровидении, они начали активную онлайн кампанию, и буквально за два дня до того, как должен был быть окончательно сформирован состав финалистов отборе, я сказала - хорошо, давайте я приму в этом участие"
"Я хочу поиграть с темнотой", сказала певица о своем конкурсном номере для Копенгагена в интервью ESCKAZ.com в Амстердаме, куда она приехала на этой неделе для участия в шоу Eurovision In Concert. После него она выступит в Лондоне на London Eurovision Party, а затем хотела бы посетить Польшу и Австрию. В интервью программе La Noche en Vela испанского радио, незадолго до отъезда из Испании, Рут сказала, что ее выступление в Копенгагене не будет содержать ни воду, ни танцы. "Мы изо всех сил пытались организовать воду, но это оказалось слишком сложно. Я и не думала, что там такая сложная логистика, на Евровидении все расписано по секундам", сказала певица, добавив, что дождь не будет использовать и победительница прошлого года Эммели де Форест в исполнении песни Rainmaker. "Они создали очень впечатляющий номер, но все это благодаря LED экранам," добавляет она. По ее собственным словам, "Я еду на Евровидение петь, и обычно для этого не требуется ничего, кроме микрофона". Певица также пояснила, что не отправится с ней в Копенгаген и итальянский танцор Джузеппе Ди Белла, с которым она выступила на Танцах со звездами. Рут Лоренцо заверяет, что "все идет по плану" и признается, что у нее "противоречивые чувства". "Это очень напряженная работа, но мне такая и нравится", говорит она, подчеркивая что "Я никогда не понимала, как это - выкладываться на половину, я всегда делаю все полностью". Она говорит, что все бывшие участники конкурса, с которыми ей удалось побеседовать, дали ей один лишь совет: "Просто получай удовольствие". "Конечно, я ставлю целью победу, но помимо этого, я знаю, что мне самой будет очень приятно выступать на огромной сцене, перед миллионами зрителей", добавляет она. В ее выступлении, по ее словам, "продумано все до мелочей". "Моя команда думает обо всем, даже те 10 секунд, которых не хватает в песне, так было сделано по определенным причинам," говорит она. Что же касается костюма, то она отмечает, что это будет платье, специально сшитое для этого случая и что она хочет быть "маленьким бриллиантом на сцене". Певица также признается, что помимо полной англоязычной версии, ее команда также в настоящее время работает над клубным ремиксом. Говоря о песнях других участников, Рут отметила, что ее фаворит - представительница Великобритании. "Как персонаж, мне нравится Кончита, она просто великолепна. И я мне также очень нравится Швеция, у них в этом году тоже очень сильная песня". "Перед тем, как погрузиться в аквариум я начала очень нервничать, плакала, я была очень напугана, эти акулы постоянно приближались, смотрели на меня... Мне действительно было очень сложно"
Певице пришлось пройти курс психологической подготовки, после чего она присоединилась к эксперту по акулам Карлу Симону, Пабло Монтото (куратору аквариума) и Терезе Мигойе, которая снимала Рут под водой, а также темнопёрым серым акулам, усатой акуле-няньке и акуле-быку, милейшему созданию весом в 159 кг и длиной в 3 метра. "Когда мы опустились на дно, я чувствовала себя нормально, но через какое-то время у меня началась тахикардия, и мне пришлось покинуть аквариум. Я запаниковала увидев серых акул, которые движутся очень быстро, и акулу-быка, которая движется очень медленно... она кажется тихой, но это ее тактика перед атакой, и она меня очень напугала. Я, конечно, расстроилась, ведь хотела провести под водой больше времени, но я действительно не могла. Первым делом после того, как я вылезла - я позвонила своей маме, которая очень волновалась за меня, зная о моей акуло-фобии"
Таким образом, хотя Рут и смогла немного понырять с акулами, ее страх ей побороть не удалось. Более того, она не хочет совершенно ничего больше даже и слышать об этих существах в ближайшем будущем! "Я абсолютно не планирую повторять этот опыт!! В следующий раз я предлагаю бросить вызов что-то типа плавания с дельфинами, или еще лучше, поедания шоколада!" После акул Рут возвращается на сцену для продолжения раскрутки своей песни "Dancing in the rain" в Европе и отправляется в тур, в рамках которого посетит Лондон, Манчестер, Бирмингем, Амстердам и Мадрид. 22го февраля, во время прямого эфира национального испанского отбора Mira quién va a Eurovisión, Рут Лоренцо пообещала телезрителям, что если завоюет поездку на Евровидение, то поборет свой самый главный страх и пойдет нырять с акулами. И момент истины настал! В четверг, 27го марта, Рут отправится на приятное свидание с акулами Зоологического Аквариума города Мадрида. Рут очень любит воду и является большой поклонницей Русалочки, но панически боится акул. Для нее борьба с этим страхом является серьезным вызовом, но, поскольку она благодарна всем зрителям, которые проголосовали за нее и выбрали ее в качестве представительницы Испании на Евровидении 2014, она хочет выполнить обещание и доказать, что она - человек слова. Рут будет нырять вместе с несколькими видами акул, и во время этого ее будут сопровождать Карлос Симон, один из крупнейших экспертов по акулам Испании, и Пабло Монтото, куратор Зоологического Аквариума Мадрида. Стал известен состав бэк-вокалистов Рут Лоренцо. Выбор пал на Mey Green, Sandra Borrego, Aiwinnie Mybaby и Alana Sinkëy. Для Мей Грин это будет третьим подряд участием на Евровидении, ведь она пела как у Пасторы Солер, так и у El sueño de Morfeo. В своей сольной карьере, в конце прошлого года она выпустила песню "Wanna Dance", которая стала радио танцевальным хитом. Мей также принимала участие в таких мюзиклах как We will rock you и El diario de Anna Frank, является победительницей ряда музыкальных конкурсов и финалисткой шоу X Factor. Сандра Боррего уже принимала участие в Евровидении 2011 вместе с Люсией Перез. Сандра начала изучать танцы 4 года назад. После завершения учебы в школе классического балета и современного танца, она принимала участие в различных телепрограммах и концертах, выступала в таких мюзиклах как Hello, Dolly и Mamma Mia и гастролировала с такими исполнителями как Ana Torroja и Malú. Еще две участницы - певицы госпел-хора с корнями из Гвинеии Эйвинни Майбэйми и Алана Синкёй. Айвини вдохновляет в ее карьере музыка ее отца, исполнителя живущего в Мадриде. Она поет в госпел-хоре Gospel Factory, и ее музыкальные направления простираются от ее первой любви - джаза, через босса-нову, соул, R'n'B и регги. Она принимала участие в двух выпусках Festival Sisters Sing The Reggae Queens, и вместе с группой Watch out исполняла в Мадриде негритянскую музыку. Певица и автор песен Алана Синкёй - вокалистка мадридской группы CosmoSoul и мадридского госпел хора Gospel Factory. Она также принимала участие в таком фьюжн проекте как PATAX и работала с такими артистами, как El Chojin, Blue Dog, Freedonia, и Raphael. В понедельник в 22.30 местного времени на телеканале RTVE выйдет специальный выпуск программы 'Mira quién baila' (Танцы со звездами) с участием Рут Лоренцо, которая исполнит на ней свою конкурсную песню. На шоу прозвучат и другие песни Евровидения и будет проведено голосование на лучшую песню этого конкурса из репертуара оркестра MQBaila. Хореограф Поти также покажет, как надо готовить к Евровидению хореографическую постановку и создаст номер на выбранную зрителями песню. Сегодня был презентован видеоклип на песню "Dancing in the rain", режиссером которого стала Палома Запата. Видеоклип также включает в себя финальную версию композиции, в таком виде как она будет исполнена на конкурсе - с еще большим использованием английского языка. "Записать видео было очень сложно, нам нужно было подходить ко всему очень тщательно, у меня была простуда, я падала, у меня пропадал голос... Но я не люблю легких решений, я всегда все усложняю. Результат того стоил, вышло очень артистично", говорит Рут Лоренцо. В видео также снялся итальянский танцор Джузеппе Ди Белла, а хореографию к нему поставила Мириам Бенедиктед. Видеоклип был снят 8го марта в старом заводе Fabra i Coats, который был построен еще в XIX веке. Вода - основной элемент клипа, и появляется в нем по-разному, а не только в виде дождя. Продолжаются переговоры о том, как эта концепция может быть воплощена на сцене Копенгагена. Во вторник, в Королевской Обсерватории Мадрида прошли съемки посткарда представительницы Испании Рут Лоренцо. "Мы хотели сделать что-то очень артистичное, показать веселую и беспечную сторону Испании", рассказывает певица. Также в эти дни Рут Лоренцо работала над видеоклипом на "Dancing in the rain". "Это были очень напряженные дни, поскольку мы были заняты съемками видео, и было сложно, потому что там было столько воды!. В то же время FAME'S - Македонский Радио Симфонический Оркестр записал струнную часть для новой версии песни", объясняет певица. Директор Королевской Академии испанского языка Хосе Мануэль Блекуа в своем письме президенту национальной телерадиокомпании RTVE Леопольду Гонсалесу Эльчинике выразил недовольство по поводу того, что песня, которая представит Испанию на ежегодном международном конкурсе Евровидение, будет частично исполнена на английском языке. Обычно Академия старается быть незаметной в подобного рода вопросах, но здесь она не смогла не отреагировать: "На испанском говорят более 500 млн человек на Земле", напомнили академики. По их мнению, певица от Испании должна петь на родном языке этой страны, не переживая, что ее не поймут. Тот факт, что часть песни исполнится на английском языке, удивил и некоторые страны Латинской Америки, которые, в свою очередь, стали ждать реакции Королевской лингвистической Академии. Само же решение о написании письма директору RTVE было принято на пленарном заседании Академии, сообщает "Испания по-русски". Представитель певицы, признался, что на самом деле первоначально песня была написана на английском языке, и сама Рут адаптировала и перевела английские строчки на испанский язык. На данный момент записано 3 варианта песни: на английском, на испанском, и на обоих языках вместе. Какой же именно вариант представит Испанию на конкурсе, до сих пор не решено. 20го января испанский вещатель TVE объявил имена 5 кандидатов для участия в отборочном туре, в рамках которого будет выбран представитель Испании на конкурсе Евровидение 2014. Это: Ruth Lorenzo (Британский X Factor), La Dama, Jorge Gonzalez (отбор 2009, Operación Triunfo, The Voice), Raúl Fuentes (2е место в отбор 2000), Brequette Shane (The Voice). Финал национального отбора пройдет в феврале с прямым эфиром на La1, победитель будет выбран совместным решением жюри и телезрителей. 10го февраля было объявлено, что испанский национальный финал Mira quién va a Eurovisión пройдет 22го февраля в 22.00 местного времени. Гала-концерт состоится в студии TVE в Сан-Кугате (Барселона). Ведущая шоу Анне Игартибуру. В состав национального жюри войдут Мерче, Давид Бустаманте и Моника Нараньо. Голосование будет открыто с самого начала шоу, продлится во время всех выступлений и еще 10 минут после их окончания. Gisela станет специальной гостьей шоу. Latimos al ritmo de un corazón.